The fifth estate‘s dramatic “jump” footage spotlighted an innocent man’s jailing. But was it fair to air it? When the fifth estate decided to take on this investigation, they tried to reconstruct the events of that infamous evening, speaking to friends and family members of Young, both in Toronto and Jamaica. As they chipped away at their investigation, they realized they were missing a key element: Sharon Stevens. After repeated attempts to contact Stevens for an interview failed, a fifth team flew to Nova Scotia to confront her. With the camera rolling, they ambushed Stevens in the parking lot of a grocery store. She became hysterical and visibly distraught. She fled the scene sobbing and didn’t answer any questions from the reporter. When they returned to Toronto, the fifth team struggled with the ethical dilemma of whether or not to use this jump interview footage. On the one hand, here was the woman whose testimony put Young behind bars. 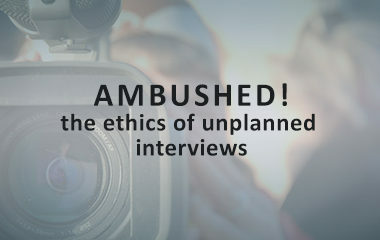 On the other hand, this potentially humiliating footage contained no new information about the case and exploited a vulnerable interview subject and breached her right to privacy. The decision was ultimately left to executive producer David Studer — should the fifth estate air the dramatic footage? Elizabeth Widner, interview by Simon Bredin, December 10, 2014. Unpublished. Victor Malarek, interview by Simon Bredin, December 12, 2014. Unpublished. Victor Malarek, David Kaufman, et al. “A Failure in System” The Fifth Estate. Aired by CBC October 18, 1994. 39 min. 4. When is a Jump Justified? 8. Decision Point: To Air or Not to Air the Footage?